Now that I’ve officially lived in Austin longer than I’ve lived anywhere else, I’m getting used to the growing seasons here. And, I get excited every time a vegetable comes into season. It’s like I’ve never eaten a tomato before when I walk into a farm stand and find heirloom beauties for the first time this year. I get just as excited when the first broccoli shows up in the late fall and for every other vegetable too. The start of each season is special, and the flavor of those first-of-season, freshly harvested vegetables is unmatched. So, I felt like I was reading the thoughts of a kindred spirit when I dove into my review copy of Six Seasons: A New Way with Vegetables by Joshua McFadden. He clearly has true respect for vegetables, their seasons, and the subtle differences among early-season, mid-season, and late-season versions. After presenting some building block recipes for flavored butters, sauces, vinaigrettes, breads, grains, and pickles, the book is divided into Spring, Early Summer, Midsummer, Late Summer, Fall, and Winter. When each vegetable actually appears will, of course, depend on where you live, but you’ll find delicious ways to use the vegetables from the first harvest through the last. A lot of the recipes incorporate breadcrumbs or croutons or nuts for added texture and flavor. And, the Brined and Roasted Almonds recipe is one that’s already become a favorite for me. It works with any nut, and it’s a simple matter of soaking raw nuts in a salty brine, draining them after 30 minutes, and then roasting them in the oven. I can’t stop making and eating these nuts and telling everyone to do this. Also, a lot of the recipes are perfectly paired with toasted bread slices or flatbread to be used as vehicles for the combinations. Some examples are the Fava Beans, Cilantro, New Potatoes, and Baked Eggs; Potato and Roasted Cauliflower Salad with Olives, Feta, and Arugula; and Israeli-Spiced Tomatoes, Yogurt Sauce, and Chickpeas. Another one on my short-list of things to try is the Carta di Musica paper-thin flatbreads with Roasted Eggplant Spread, Herbs, and Ricotta Salad. This isn’t an entirely meat-free book, but the focus stays squarely on the vegetables. 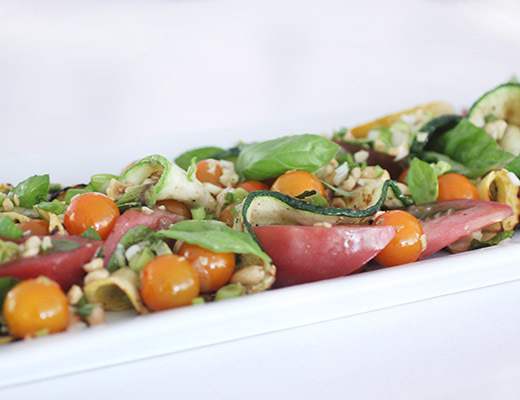 Since our “summer” vegetables arrive early, I’ve already been enjoying summer squash and tomatoes, and I loved the idea of using them in a salad with Asian flavors and lots of herbs. I did make one little change to the suggested process. The recipe was intended to make use of thinly-sliced, raw ribbons of summer squash and zucchini. But, I was using the grill that day anyway and liked the idea of adding a slightly smoky flavor to the dish. I gave the ribbons just a minute on each side over the coals before proceeding with the salad. The sauce was a mix of minced hot chiles, minced garlic cloves, fish sauce, water, and white wine vinegar, and it will keep for several weeks in the refrigerator. The rest of the salad components included havled cherry tomatoes, I added some larger tomatoes cut into wedges, thinly sliced green onions, basil leaves, mint leaves, chopped peanuts, and olive oil. Everything was tossed with the Spicy Fish-Sauce Sauce and olive oil and placed on a platter. The fresh herbs and crunchy nuts mixed well with the vegetables and the spicy sauce, and the salad was great alongside grilled shrimp. This book was a welcome read thanks to the care with and interest in vegetables at their very best, and the layers of flavor worked into each dish will keep me coming back to try more things. 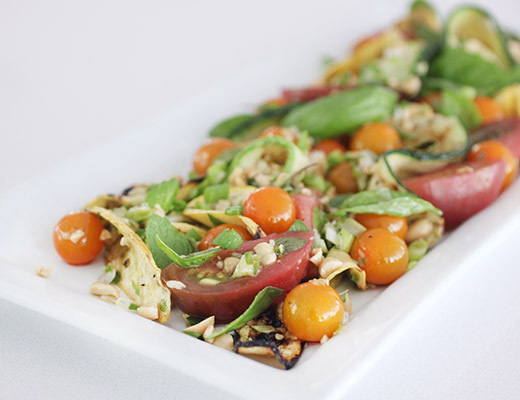 Excerpted from Six Seasons: A New Way with Vegetables by Joshua McFadden (Artisan Books). Copyright © 2017. Photographs by Laura Dart and A.J. Meeker. Using a mandoline, carefully slice the zucchini from the bottom to the top to create very thin ribbons of squash. (If you don’t have a mandoline, just cut the zucchini into very thin crosswise slices, to create rounds.) Toss the squash with 1 teaspoon salt and put in a colander so the salt can draw out excess moisture. Let them sit for 30 minutes. Blot the squash on paper towels to remove the moisture and excess salt. Pile into a large bowl. Add the tomatoes, peanuts, scallions, basil, and mint. Pour in the spicy fish-sauce sauce and toss again. Taste and decide whether the salad needs more salt. Add 1/4 cup olive oil and toss again. Do a final taste and toss, arrange on plates, and serve right away. Lotta neat flavor and textures going on here! Not to mention colors. Perfect for the season -- thanks. So many veggie cookbooks out now! This sounds full of Vietnamese flavors which I adore! So summery and delicious! I really love those yellow tomatoes...the colour just pops! this dish looks super complex and completely amazing! 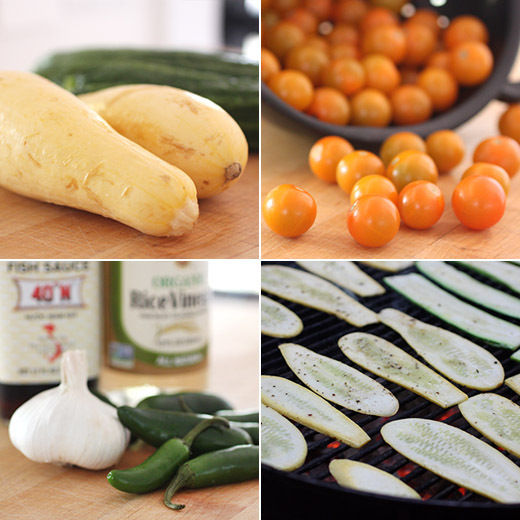 your impromptu grilling of the squash was a great idea. I have that book! It is wonderful! I think this recipe escaped my personal radar, for some odd reason... thanks for bringing it to my attention, love everything about it! A perfect summer dish! I have this cookbook, too, and can't wait to start cooking out of it now that my local farmers' market is overflowing with irresistible provisions.